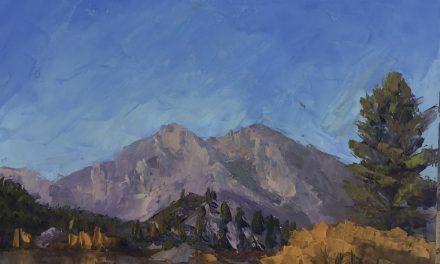 I’m up near June Lake in the Sierra’s on a plein air painting trip with friends. We are staying at a lovely cabin by Gull Lake. 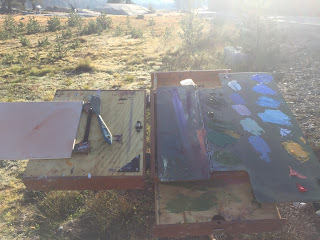 This morning we woke up early and drove to Tuolumne Meadows in Yosemite National park. The morning air was crisp and at 7:30 in the morning, fairly quiet. I set-up my paints and got ready to paint. Since I paint with a palette knife, I’ve actually started using my easel flat…makes it easier to get the paint to the edges. I use Alla Prima Pochade — it’s designed with a magnets, so it’s easy (but surprisingly sturdy!) to move this easel up and down. Here’s my 8x10 sketch…I’m fairly happy with it…need to do a few refinements…but the wind came up the light completely changed. When that happens, we have a choice: either “chase the light” (which never seems to work) or finish it up later. After we left the area, we drove by Mono Lake — since it was after lunch, the light wasn’t quite right. We’re back in the cabin, I’m looking out the window at the lake beyond. Around 4:30 we’re headed back out to paint Mono Lake at dusk. NextUp and Running for Three Weeks worth of exhibits and shows!